Sly! Do you know why the servers down? Do you like any of mine bak? ? After all, we strive to always be the next best thing of all MC Servers. 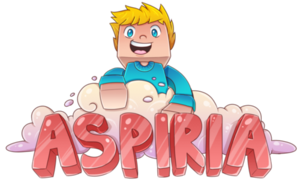 I created a little logo for one of the name's i like the most for the new server with is magicville. Keep them coming if you have ideas! Instead of coming up with logo ideas lets try and keep more names coming We still have over 24 hours to make a decision, and we will find someone to create some great MC related artwork, so no need to focus on it yet. Once we pick a name we can collect suggestions for the logo! 2 words are best o3o. Yeah I know it's just I thought some of them sounded better with three. Plus I don't think I will win so I'm just coming up with ideas that sound ok or good. You have a decent chance of wining because you posted a lot of names \owo/! I guess I do but, there's still a lot of people who posted other names too. Though whoever wins I will be happy for them! I will be happy for whoever wins to . How about Dream Realm, as in the Minecraft end poem it states that Minecraft is simply the short dream of a game and even though we become good friends on it, we may never actually meet each other. Idk just something I came up with. I think it needs to be improved on but maybe I spawned some new ideas? I said Dream Realm o3o.